Netizen Report: Will Egypt’s Jailed Bloggers Ever See Justice? 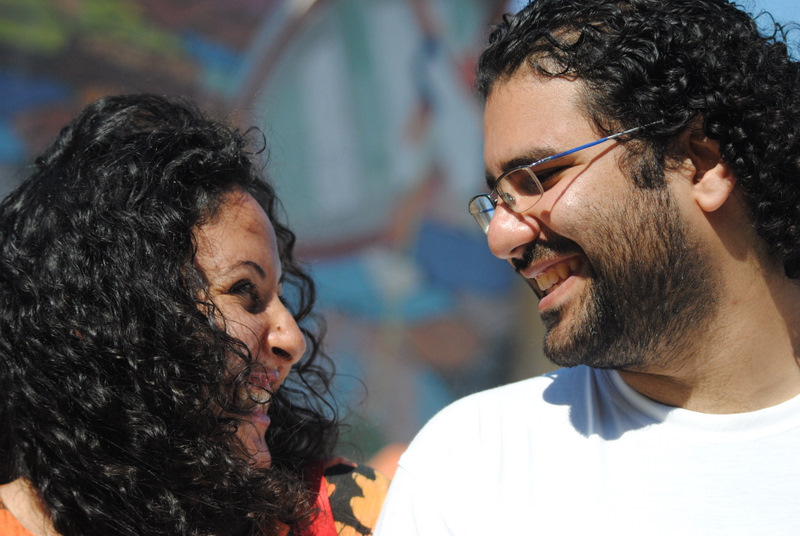 On 19 October, Egypt’s highest court of appeal postponed the trial of prominent activist and blogger Alaa Abd El Fattah to 8 November. The 36-year-old father and husband was a leading voice in the 2011 protests that helped to overthrow former president Hosni Mubarak. Abd El Fattah is currently serving a five-year jail term for violating Egypt’s protest law, which prohibits public demonstrations without prior authorization by police. He has already served 3.5 years of his sentence. In Thursday’s hearing, the judge withdrew from Alaa’s case and referred it to another circuit. As the reason, he cited “embarrassment” without providing any further clarifications. Abd El Fattah is being prosecuted for taking part in a protest denouncing military trials of civilians in November 2013. Although several people were arrested for participating in the demonstration, all of them — apart from Abd El Fattah — have since been released or pardoned. In a separate case, Abd El Fattah faces an additional jail term for “insulting” the judiciary over a tweet that criticized Egypt’s justice system for its lack of independence. This charge stems from comments he made during a controversial 2013 trial in which 43 NGO workers were sentenced to prison after they were found guilty of defaming the Egyptian judiciary. In 2016, the UN Working Group on Arbitrary Detention has concluded that Alaa’s detention is “arbitrary” and identified several irregularities in his trial. “Mr. Abd El Fattah has not been guaranteed the international norms of due process and guarantees to a fair trial,” the group said. Since Egypt’s 2013 military coup which ended the rule of elected president Mohamed Morsi, and brought to power general Abdel Fattah al-Sisi, thousands of activists, journalists and protesters have been imprisoned. Rights groups say 60,000 political prisoners are languishing in jail under Egypt’s flawed justice system. Violations under the system include ill-treatment, arrests without warrants, lengthy pretrial detentions, mass trials, military trials, and a disturbing rise in death sentences. In another prominent case in Egypt, the trial of photographer Mahmoud Abu Zeid (known as Shawkan) was once again postponed. Shawkan, who has been in pretrial detention for five years, will appear before court again on 24 October. He was arrested in August 2013, while photographing Egyptian security officers using undue force against protesters who opposed the ousting of Mohamed Morsi. While the Egyptian government has taken a harsh approach towards public protest, their tactics for monitoring the activities of human rights and democracy activists extend deeply into the digital realm. Since the protests of 2011, there has been significant evidence that Egyptian state actors have used technical surveillance in order to target activists. The German government reportedly canceled a security training for Egyptian police in monitoring cyber crimes and extremist content. According to Associated Press, the German government decided to cancel the training for fear that the police would use acquired skills to monitor citizens who have no connection to organized crime. According to the New Delhi-based Software Freedom Law Centre, more than 23,000 web URLs are currently censored in India. The independent advocacy and research group obtained this information through a Right to Information request, which was fulfilled by the Cyber Laws and E-Security Group under Ministry of Electronics and Information Technology Group. Photo by Omar Chatriwala on Flickr and used with Creative Commons license. The US-based video and voice calling application Skype confirmed that it is blocked in Qatar. In a statement, the service, which is owned by Microsoft, said there is “very little Skype can do about this situation.” Doha News reported that users in Qatar started reporting issues when trying to use voice-over-IP (VoIP) services including WhatsApp, SKype, Viber and Facetime, back in August. Neither regulators nor the country’s two telecom operators, Ooredoo and Vodafone, explained the reason for the suspension of services. In other countries, regulators have blocked VoIP services in an effort to force customers to pay long distance call fees to local telecom operators, rather than use services like Skype or WhatsApp, which operate on internet infrastructure and typically come at no additional cost to the customer. A Japanese group known as the Anti-Racism Information Center recently launched a website called the “2017 House of Representatives Election Hate Speech Politicians Database.” The site purports to contain information about dozens of hateful, discriminatory statements made by various active politicians running for re-election. Photo of Iran by David Stanley on Flickr and used with Creative Commons license. Iranian human rights defenders and journalists have reported challenges getting help from social media companies when they face harassment and hacking on platforms like Facebook and Twitter. Obtaining verified status can provide users additional protections against false reporting and politically-driven flagging of content, but Iranian users told Global Voices researcher Simin Kargar that they faced challenges obtaining verified status even after sending the required documentation. Additionally, there is no information available in Farsi on how to obtain verification or to guide users on reporting and documenting harassment on Twitter, Facebook or Instagram. The Netizen Report is produced by Global Voices Advocacy. Afef Abrougui, Ellery Roberts Biddle, Mong Palatino and Sarah Myers West contributed to this report.